On 15 April 2013, two homemade bombs exploded near the finish line of the Boston Marathon. The blast killed three people and injured hundreds of others - many losing limbs. In addition to recreating this tragic event, Patriots Day also depicts the FBI investigation and dramatic manhunt for the two brothers responsible - Dzhokhar Tsarnaev and Tamerlan Tsarnaev. Director Peter Berg shows how Boston responded to the attacks, revealing inspirational solidarity and resilience. Both gripping and moving, Patriots Day treats its tragic subject matter with sensitivity and respect. As the final title cards disappeared... I felt exhausted and deeply disturbed by all that I had seen. However, I was also thankful for films such as this - movies that, while difficult to watch, remind us of important moments in history. For, 50 years on, perhaps the most devastating aspect of Detroit is how relevant Kathryn Bigelow's film feels today. In 1996, American historian Deborah Lipstadt (Rachel Weisz) was accused of libel by David Irving (Timothy Spall) after she declared him to be a Holocaust denier in her book, Denying The Holocaust (published in 1993). In England, the burden of proof falls upon the defendant in cases of libel. As a result, it was up to Lipstadt and her legal team - led by solicitor Anthony Julius (Andrew Scott) and barrister Richard Rampton (Tom Wilkinson) - to prove and honour the truth of the Holocaust. In our post-truth world, where facts come under fire on an almost daily basis, Denial is utterly essential viewing. For not only is Mick Jackson’s film about the (truly terrifying) issue of Holocaust denial, it is also a rallying cry for historical truth. Dunkirk is both visually and aurally stunning - a deeply moving story brought to life by a superb cast and told via tales of land, air and sea. What Is Your Favourite True Life Film Of 2017? There have certainly been some amazing and moving stories told in 2017. 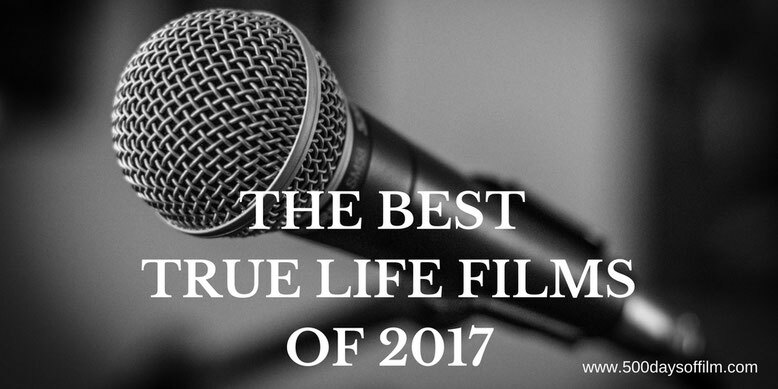 What were your favourite true life films of 2017? Let me know in the comments section below or via Facebook or Twitter (@500DaysOfFilm).